Plot: Setting a trap to assasinate and discredit 007. SMERSH selects the British Secret Service as the target for a 'konspiratsia' - their agent James Bond is to be implicated in a scandal, and then killed. M hears of a Russian woman wishing to defect, and the trap is set. Name: Bond, James. Height: 183 cm, weight: 76 kg; slim build; eyes: blue; hair: black; scar down right cheek & on left shoulder; all-round athlete; expert pistol shot, boxer, knife-thrower; does not use disguises. Languages: French and German. Smokes heavily (NB: special cigarettes with three gold bands); vices: drink, but not to excess, and women. 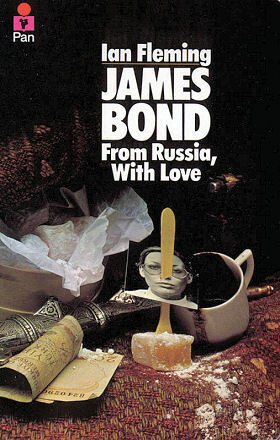 In the first third of the book, the planning of Bond’s assassination and humiliation takes place. The Russian Secret Service wants a real intelligence coup, and hands this task to Bond’s inseparable enemy, SMERSH. SMERSH decide that their chief assassin, the brilliant and evil Donovan ‘Red’ Grant will carry out the killing, but only before Bond has slept with a Russian agent while on tape, the bait for which was the prized SPEKTOR decoder. 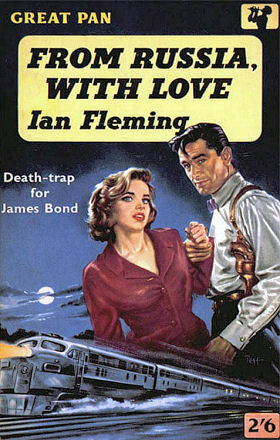 The idea is that Grant will kill Bond and the girl, Tatiana Romanova, before releasing the tape, making it seem like Bond killed himself and Tatiana following some kind of sordid sexual tangle. Everything goes pretty much to plan, as Bond and Tatiana seduce each in Istanbul other before making love in front of a hidden camera. Bond and Tatiana take the SPEKTOR (which is booby-trapped to explode on inspection by MI6's top scientists) and board the Orient Express to Europe, pursued by various KGB operatives. Bond, and his new friend Darko Kerim, head of Station Turkey, kill all but one of the KGB men, but Kerim and the remaining man kill each other. 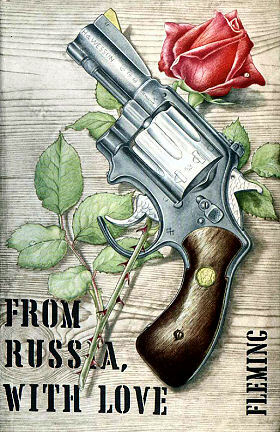 Grant then makes contact with Bond, misling into his trust by posing as a British agent, and explains the whole plan to Bond after subduing him and Tatiana. As Grant finally shoots Bond, 007 deflects the bullet with a book and a cigarette case, and Grant is shot dead by Bond in the ensuing fight. In Paris, Bond attempts to apprehend SMERSH’s Rosa Klebb, but is tricked by her and stabbed with a poison-coated blade. Bond topples to the floor as he loses consciousness. Only in Dr No do we learn that Bond survived, thanks to a fortuitously nearby doctor who dealt with the Fugu poisoning. Rosa Klebb was eliminated shortly after, and the tape had been destroyed. "M gestured to the chair opposite him across the red leather desk. Bond sat down and looked across into the tranquil, lined sailor's face that he loved, honoured and obeyed"
M: "Doesn't do to get mixed up with neurotic women in this business. They hang on to your gun-arm, if you know what I mean." "Bond sat down beside her. 'Tania,' he said, 'If there was a bit more room I'd put you across my knee and spank you'"
"Kerim shook his head. ‘These Russians are great chess players. When they wish to execute a plot, they execute it brilliantly. The game is planned minutely, the gambits of the enemy are provided for." "What a shambles! The place looked like a butcher's shop. How much blood did a body contain? He remembered. Ten pints. Well, it would soon all be there." "The minute precision with which this outrageous operation is described is a good example of the skill which has made Mr. Fleming the most readable and highly polished writer of adventure stories to have appeared since the war." 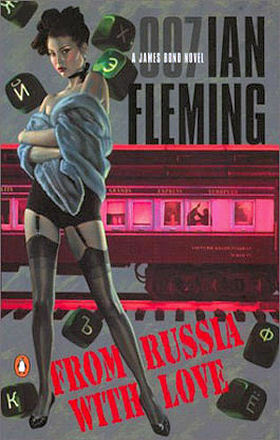 "Ian Fleming is the most exciting new writer of thrillers to appear since the war, and the phenomenal success of his first four books suggests that a great many other people agree... he combines the more sensational features of american gangster fiction with a high degree of literacy and genuine sophistication; then he presents his whole sleek creation with a cosmopolitan flourish"
"At least neither Mr. Fleming or his hero shares the twentieth century characteristic vice of cant. They are both carnivorous to the back-teeth and like their meat well hung. this, coming in the age of the murderous vegetarian, is rather pleasant than otherwise. for myself I am inclined to wish Bond many years and quick promotion in the order of St. Michael and St. George"
"One of the most outrageously entertaining thrillers ever contrived"